Banana flower is an edible flower that blossoms in a banana plant and they hang like tear-drop-shaped-pendants at the end of the banana clusters. They are native to tropical countries : India, Sri Lanka, Vietnam, Thailand, Burma, Phillipines, China and are widely used in soups, stir fries, curries and fritters. They are sold in Asian grocery stores year round.The inner petals also called as bracts are the edible parts. Don’t even think about eating it raw, as it will leave a bitter taste in the tongue. If you are really curious to taste it, eat them after soaking in water for 30 minutes. It will be slightly crunchy in texture and delicate in taste. The banana flower has a deep magenta covering which could be peeled as layers. It can be found in most Indian households. My grandmother has two trees in her backyard and her banana fruit tastes as sweet as honey and instead of plates, we eat in banana leaf. We discard the leaves after our meal, just like use-and-throw plates. The entire banana plant: the shoot,leaves, fruits, flower are used for cooking. The plant will fruit only once, after bearing the fruit, the plant will be cut and every part will be used for cooking and eating. The huge leaves are used as serving plates (organic plates) or cooked with fish/vegetables to create steamed delicacies. The fibrous threads that could be pulled out of the shoot is used to make flower garlands in India. Always look for firm varieties and wrap them tight in a plastic foil until use, to retain the freshness. First wash the flower under running tap water. The cleaning will stain the hands, so use a kitchen gloves or apply cooking oil before doing this. This will prevent the sticky sap sticking to your hand and that leaves nasty black colour for few days. The cooking preparation begins with removing the bitter sap from the redbracts, which is definitely a tedious process. Remove all the red outer covering until you reach an ivory colored bulb called Banana Blossom Heart. First remove the outer manganta outer layer, pull out the tender yellow tipped florets. As you remove, store them in water. A black stigma and transparent covering which will taste bitter needs to be pulled out before chopping. Chop off the florets and white bulb to smaller pieces and place them in water. This helps in preventing discoloration. 1. Boil water in a cooking pan. Add the banana flower to a boiling water pot and cook for 10 minutes, until they are soft and done. Drain the water through a colander and squeeze with the hand to remove any excess water. Set them aside. 2.Heat oil in a cooking pan and once the oil ripples, add mustard seeds to it. Let it pop, add channa dal, urad dal and halved red chillies. Now add asafoetida and curry leaves and mix well, approximately 30 seconds. 3. 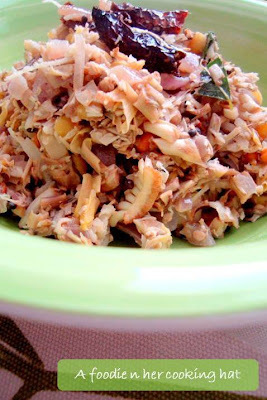 Mix in finely chopped onion and saute on a medium flame till they turn light golden brown, about 2 minutes. Add turmeric and mix well. 4. Add the cooked banana flower to the pan. Stir fry for 2 minutes at medium flame till they are mixed well with the spices. 5. 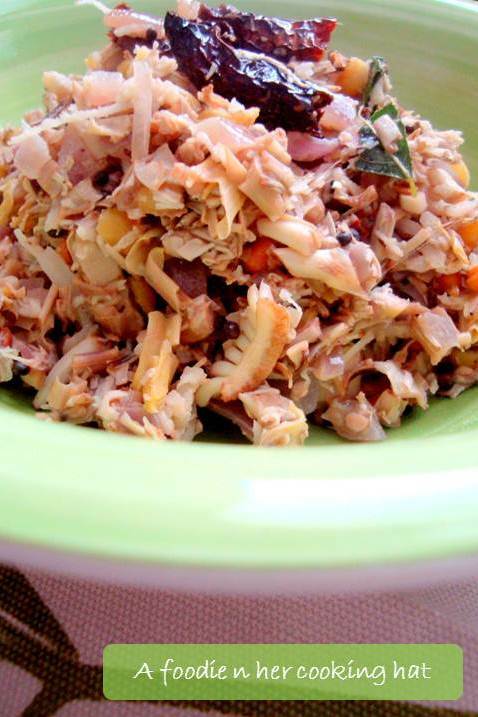 Add salt to taste and sprinkle grated coconut on top and cook for another 2-3 minutes. Serve hot with steamy Indian rice and rasam (onion rasam, pineapple rasam and coconut milk rasam) – Click here for the recipe. This is my entry for the event Healing food – March 2011 (Artichoke/Cardoon/Banana flower), originally started by Siri and hosted by Sweet Artichoke for this month. Here is a chance to win the Award-winning celebrity chef Rocco DiSpirito’s cookbook. Click here to enter. Interesting recipe !!! I have tried this before !!! Very healthy ,yet tasty thuvattal.I am craving for the one here. I did not have this before though I wrote a lot on plantains. I think amma might know about it. I understand this is a tough job playing worth this part of banana plant. Delicious and healthy banana flower stir fry. Missing them here. What a delicious recipe! I really like the detailed explanations on how to prepare it and the result look yummy! You must send this in to Kerala Kitchen! 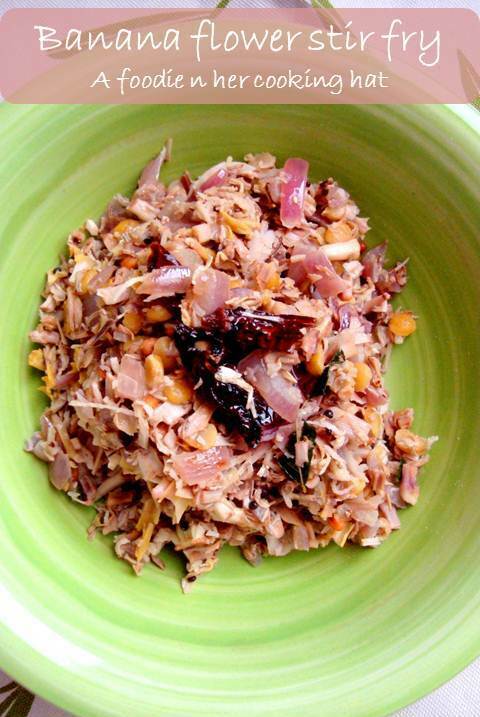 Come join us and share your Kerala inspired cooking every month with a bunch of awesome foodies! Thanks for sending this delicious recipe! 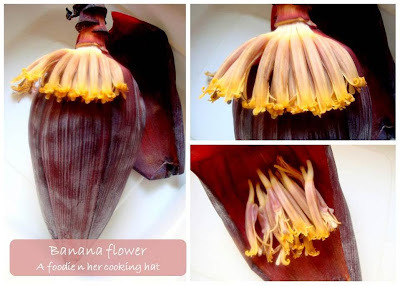 It is a very intersting post, I really enjoyed reading the informations about banana and banana flowers! Wat a healthy stir fry…just love it with some hot piping rasam.. I remember my paati call the same way,thuvattal, nice recipe..
wow healthy n yumm have only made paruppu usili with this sure try!!! the dish looks absolutely delicious!….yummy curry! What an interesting post! I saw a banana flower for the first time a few days ago and wondered what they were used for. Thanks for sharing this! 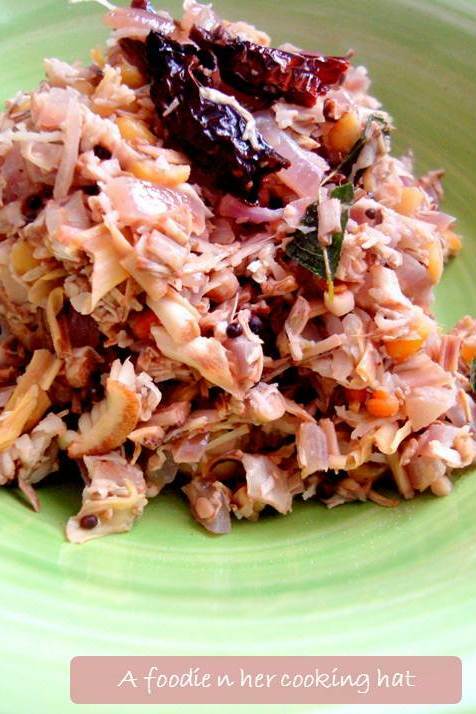 My hearty Congratulations Vijitha on winning the Healing Food Event for this entry!!! 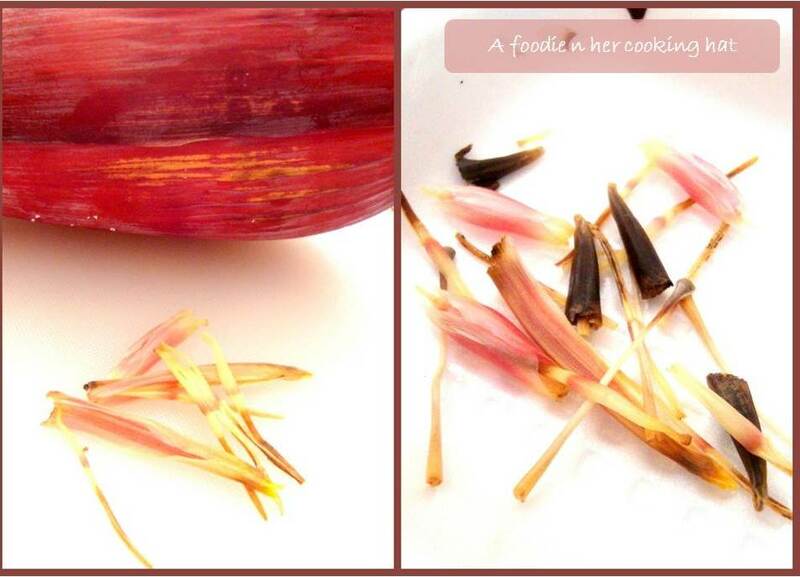 i've spent a lot of time looking for a good step by step on preparing the banana flowers; what a delight to find yours! Years ago I prepared the salad once and decided it was way too much work for so little 'flowers' to prepare! thanks for showing this, and maybe I'll try again! I will point my subscribers to your post! Thanks!